Daisies are a wildly popular flower. While we generally think of the classic white daisy when discussing this flower, it belongs to the same family as Sunflowers and Asters, and the Daisy itself has an incredible amount of variations. Gerbera Daisies have become an increasingly popular choice for fresh cut flower bouquets in recent times, particularly as part of vibrant wedding arrangements. Here are five interesting facts about the history of the much-beloved daisy. 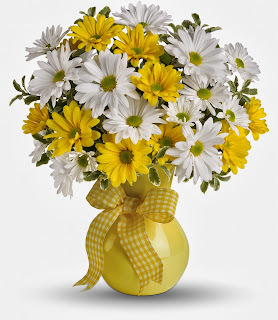 - Daisies are traditionally used to convey a sense of innocence, or sometimes, a child-like sense of purity. - Daisies close up in the dark (at night) and open in the morning; it's thought that the flower received its name as a shortening of "Day's Eye" in reference to this. And because of it's resemblance to an eye, it was thought to be an effective eye treatment. - The oldest record of daisies are thought to be from stone carvings from Ancient Egypt, around 3000 BC. - It's likely that the earliest Daisies evolved about 50-60 million years back. - It was used for medicinal purposes by the Egyptians, as well as throughout the middle ages in England. King Henry VIII was a fan of eating them, as they were thought to cure stomach pain.